Thirteen days into the New Year, 2016, the oldest Mexican wolf passed away peacefully. Her final breath was marked with a wolf song shared by every Mexican wolf at our sanctuary. 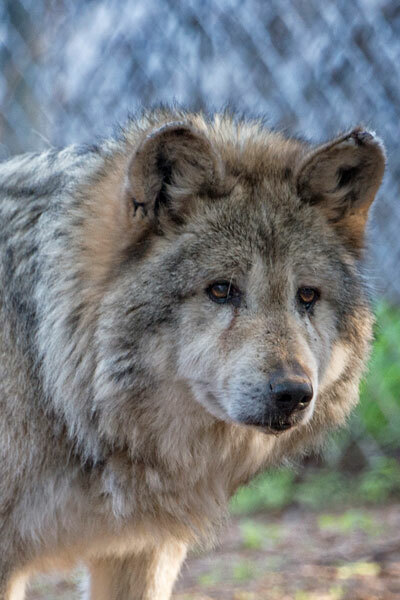 Manilita, F522, lived at Southwest Wildlife for nearly 16 years, but remained a wild-acting wolf. She recently lost her hearing and most of her eyesight, but she never lost her wolf dignity. She was once, for a short time, “Blue Free.” Blue Free is the location shown for those fortunate few Mexican wolves living free and wild. In January, 2000, she was chosen for release with the alpha male of the Campbell Blue pack, but she interacted first with hunter’s dogs and then with ranch dogs, and was captured and removed from the wild. She arrived at Southwest Wildlife in November of 2000, and lived the remainder of her life at our sanctuary. Half McBride and half Ghost Ranch lineage, this tough old girl was born at the Cheyenne Mountain Zoo in Colorado on May 3, 1997. In 2015, before her 18th birthday, she became the oldest Mexican wolf ever. The U.S. Fish and Wildlife Service’s Wolf Recovery personnel and the Studbook Keeper for the Mexican Wolf confirmed that Manilita broke the previous record of 17 years and 3 months of known aged Mexican wolves. When she died she was 18 years and 8 months old – a remarkable age! Manilita lived most of her years with her long-time companion George, M728, who passed away a few months before her, in the Fall of 2015. She was a very special wolf.